These are the strap lines on T-Shirts in July in Kidwelly, Camarthenshire: more than a hundred artists taking over an industrial museum to live and breath casting iron. Hard hats, leather aprons and jackets, work boots, gloves, face masks, blast furnaces, lots of moulds being made and poured. This isn’t the cool clean sculpture of the London art world. This also isn’t a conference centre – it’s a temporary working environment – a sort of pop-up Sculpture Department/ Workshop/ Symposium/ Camp. In fact you’d be forgiven for thinking that this has nothing to do with contemporary art at all. The urgent interest in what can be done with digital modelling and outputting might seem a million miles from charging a furnace with coke, huge fans blasting air and temperatures of more than 2000°C. Mary Bates Neubauer points out that foundry processes and rapid prototyping technologies are doing basically the same thing – exploring means of reproducing three dimensional objects. So, whether you are modelling in clay, taking moulds, making waxes and then making shell mould into which to pour hot metal, or modelling at a computer, downloading 3D wire frames into CNC machines, the concerns are fundamentally similar. This is the interface of art and technology (in both cases old and new and see below for how old some of the ‘new’ technologies are). It’s the edge where sculpture and the ready-made blur into each other. Duchamp’s infamous Fountain (1917) is important because its in a state of flux between the everyday functional object and the sign – take it out of the gallery and it’s a urinal, put it in the gallery and it’s an artwork. That’s not to say that all the artworks on display in the exhibitions associated with the 6th International Conference on Contemporary Cast Iron Art are as sharply on that edge. In fact the good ones are gallery quality art objects and the bad ones are trite. There are aspects of the aesthetic of this bunch of artists which slide off into biker culture or simply regurgitate stereotypes such as flowers growing out of pistols. Whilst the conference seems largely organised by women (and there are as many women working furnaces as men) the title for one show, Iron Maidens, could be more imaginative. But stand out works include Deborah la Grasse’s Torn; Dilys Jackson’s Sulphur Growth and Starry Growth, both investigating the relations between made and found materials, and Jackson’s two beautiful drawings Spread I and II where the simple act of pinching a piece of paper, perhaps in a vice, results in exquisite works; Cynthia Handel’s drawings; Julie Ward’s Pink Clam Clutch, a cross between a giant clam shell and an elegant ladies’ bag; Carrie Phoenix’ Sewn Leather, another work which touches on the domestic. The whole show is basically monochrome (apart from the pink inside the Clam Clutch). It’s largely domestic in scale and one of the most interesting currents running through is the domestic, a concern with everyday work and activity which isn’t considered of high value. Adjacent is an open exhibition where the work varies in quality (viz. the pistol I mentioned), but amongst that note-worthy work includes Christopher Keating’s Frozen Moments, simple bowl shapes poured and allowed to cool so that the surface of the bowl is the captured ripples and eddies of molten iron caught at the moment of change from liquid to solid; Matthew Tomalin’s Bowl; Nick Lloyd’s Between; Harvey Hood’s Carnac Man and Mary Neubauer’s Anomalies in Global Positioner. This last work, a chrome-plated cast iron abstract ring shape has a surface pattern derived from data taken from exactly what the title says: anomalies in global positioning systems. Neubauer fed the data set into a 3D modelling programme and through a process of testing algorithms established a form. This was then output using rapid prototyping to a wax and into a mould which was then cast and chrome-plated. The object visualises and creates form from data involved in modern navigation systems. Making, exhibiting and seminars are put aside in the evening for events: furnace operation as performance. It is a visceral experience of heat, noise and smell in a foundry and taken into a public setting it can be cathartic. Bear in mind that at SSW we used to work with artists including George Beasley, Matt Toole and David Lobdell (all of whom are here) to do such events, so I’m interested in this form of work. 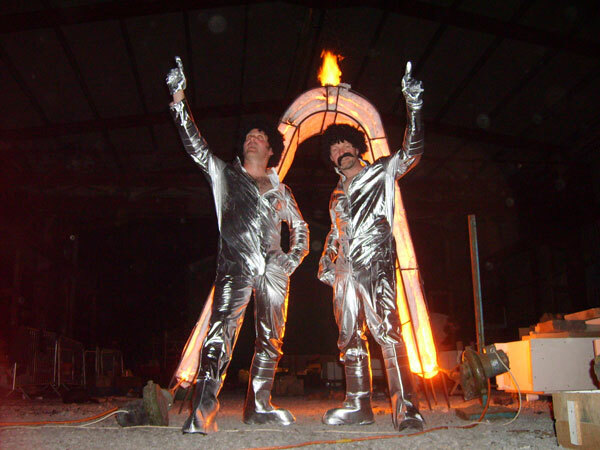 And the Blue Cowboys intimate performance, entitled I believe Great Balls, dressed as disco divas (earth and wind), using Lobdell’s fire arch to play out instructions provided by their Polish collaborators had the right level of irreverent punk attitude about it. The performance on the night I arrived, created by the team from the Crucible on the West Coast was absolutely fantastically awful. It was a multimedia extravaganza of industry, rhythm and writhing dance. The noise created to accompany the process, made with instruments improvised from scrap bicycles and plumbing, was grounded in the heart beat of a wheel on a wooden box amplified to catch the impact. That ‘heartbeat’ was joined at exciting moments by a sound like a steel guitar, but made by an incongruous contraption, an organ blown by gas cannisters, and a percussion instrument made of white plastic plumbing and beaten with flip-flops. Of all of it that was the most interesting. Around a large coffin-like mould in the middle of the performance space were positioned dead branches from trees all painted white. A number of nubile young artists crawled around amongst these and then at various points actually picked them up! But the key performance was reserved for the shaman figures. They were allowed to work with fire. And they were the ones who really got to writhe and wriggle around wearing flaming fingernail extensions and headpieces. When the mould was actually poured it became apparent that they had made a FIRE SYMBOL full of portents and deep meaning. I missed the discussion the next day when they explained that they were channelling the Celtic spirit. I’d have loved to hear them justify that! West coast Americans in touch with their inner Celt, and to think I thought 10 hours on a train was tiring. Going back to the panel session, the presentations covered two territories: Laura West’s one on the range of technology currently available, from high-end commercial equipment to ‘makers’ and build-your-own rapid prototyper. The other historical, as described by Eric McMaster, and draws a line from Alhazen, the 11th Century Iraqi who discovered the conical nature of human sight and thereby established the scientific principles of perspective, through the Italian Renaissance scientist Marino Taccolo, to Descartes, Francoise Willeme’s photosculpture and John Parsons invention of CAD subsequently appropriated by MIT. To this are added Vitkine and Bezier (of the curves). Descartes role in this, inventing Cartesian geometry (xyz axes for locating things in space) underpins digital culture. The third territory which was insufficiently discussed, was the aesthetic. All this stuff exists, we didn’t just invent it, but we do need to talk about aesthetics. The other performance I saw, created by Matt Toole and perhaps a little hokey, at least acknowledged its context. Toole’s performance was the final event of the conference and was a celebration. Working with a team, during the day Toole had set up a series of contraptions on a site behind the Kidwelly Community Centre, where the final meal and dance was going on in the evening. By the evening this space was dominated by two large arms, cantilevered at the elbows, with crucibles attached to the end. These were positioned such that they controlled a large space as they swung in large arcs, and up to a height. The furnace was tapped into one crucible lowered into position. This was then swung through 180 degrees to meet the other crucible at height. As the furnace was tapped a small group started walking and singing something like “We come over the water, we come through the air,” in front of the crowd. As the crucibles met in the sky a loud cheer of the Welsh greeting ‘Yakky Dah’ went up. The arms then swung down and back up at which point the crucible of iron was tipped into the other crucible amid a shower of sparks. This second crucible was then swung around to meet one of four wooden torches about 10ft off the ground. The molten metal was poured into the wooden vessel to create a blazing torch amid another shower of sparks. This was repeated four times. Almost no performance such as this goes without a hitch, and Toole had a few, but he had contingencies in place. Toole had focused on the key elements of conviviality and sharing and had constructed his work to represent and reinforce those themes. There was some discussion of the rhythm of the performance: it was commented that once you had seen the process once, you knew what was going to happen on each occasion. But the choreography was clear and the intention evident, if perhaps there was a lack of ambiguity. But the question of aesthetic remains. It is perhaps not a question only answered by comparing these two performances or by highlighting specific works in the exhibitions. Individual practices are relevant, but the broader context of this ‘group’ of artists might be interesting to consider. The conference has been hosted for a long time at industrial heritage and sculpture centres: Sloss Historic Furnaces in Alabama; Johnson Atelier, New Jersey; Ironbridge in Shropshire and now Kidwelly in Wales. Here in Kidwelly for a few days there is an overt interest in the process of making art. In fact it is worn as a badge of honour. It’s a bit like how some of the more vivid characters are from the South: recidivism is worn as a badge of pride. But in reality most of the artists here have practices that extend in several different directions. Some examples might include Mary Bates Neubauer who, amongst others, uses sculptural methods to visualise data. I described one of Mary’s pieces in the earlier post. Coral Lambert showed me a piece of Paul Higham’s which had used data on poverty to create a landscape you could hold in your hand. George Beasley is known for his site specific performances, of which he has done two successfully in Strathdon, Aberdeenshire. Beasley’s performances are work as performance, underpinned by an interest in ‘work’ encompassing in particular migration and labour practices. There is no narrative beyond the need to make a mark of some description, sometimes just an X, and an elegant way to do that on the site. His art spans drawing as well as public art: a devout atheist, he has built up a reputation creating work for religious buildings. Eden Jolly, Foundry Master at SSW, makes work which ranges from the exploration of process and material, testing his own technical ability, to conceptual pieces such as the small bronze ingots cast with the text “Get off my land” and occasionally thrown into the heather as he walks across a grouse moor. His ironic statement is not directed at the grouse! These individual practices might be paradigmatic examples, but the Conference is the moment when a network comes together once every four years. This network is both more than the Conference and also a form of organisation with its own specific characteristics. It’s not an institution, having almost no bureaucratic baggage, but it is in the sense of being an entity capable of description. Some of the characteristics were observable during the event. Whilst most of the key individuals are at least part-time academics and bring cohorts of students, their institutions are not directly involved, so the conference is not hosted at an academic institution and there are no senior management dropping in to do welcome addresses or acknowledgements. But the conference is ‘chaired’, utilising the US academic tradition of leadership of an academic department being through a rotating chair. Full participation in the group/network is signalled by building a furnace: it’s probably not a necessary condition, but it does seem to be the normal one. The process of building a furnace signals, by the investment in time and effort, serious intent. It also requires extensive contact with other members of the group. Practically this contact is to obtain plans from which to build, names of suppliers of materials, knowledge about recipes, etc.. On the back of this residencies and exchanges take place, enabling experience to be accumulated. Sometimes the network coalesces to support the initial operation of a new furnace. 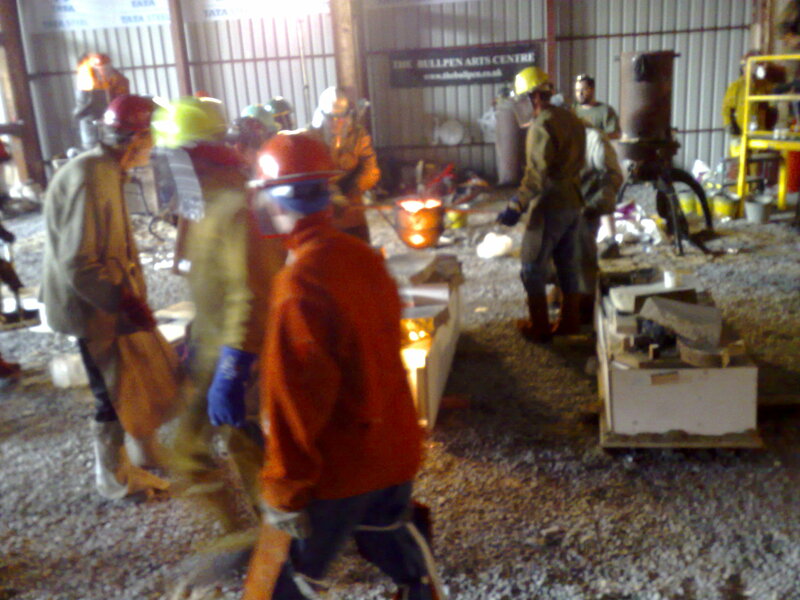 Learning is fundamental to this network: you see it on the ground in the furnace shed with people helping each other to make moulds and operate furnaces. This DIY mode of operation is also a key aesthetic. It links the participants to other cultures such as those involved in DIY computing (I referred to those building their own 3D printers) or an LPG-powered water-cooled furnace was being demonstrated. You may ask “Why on earth…?” but apart from “Because we can”, the environmental protection legislation on the West Coast of the US is so restrictive that traditional blast furnaces may well get closed down and this technology may provide a viable alternative for small art foundries. Another interesting experiment undertaken within the network was Toole’s project to build the ‘exquisite furnace’, based on the Surrealist game, he asked ten colleagues to contribute specific elements (legs, tuierers, etc) which he then brought together into one object in which a large number of people have an investment. This process of gifting to a collaborative project contrasts with dependence on the commercial gallery sector where many of these artists are represented. Rather than rejecting the art market, many of these artists utilise it as well as loose networks and academe to enable them to maintain the different dimensions of their practice. If the Conference is a coming together of a group or network of artists, it is a network with no single central node. Rather a few individuals constitute key points in the network, and the network has a very loose or soft boundary. This soft boundary exists both in the sense that new people can easily participate in the network, and also that the members of the network are involved in practices encompassing more than working in cast iron. “These range from the amorphous category of reputation gains to much more mundane benefits, such as consulting contracts, customization services, and increases in human capital that are paid for by employers who can use the skills gained from participation in free software development in proprietary projects.” (Benkler, 2002). The Iron Conference is perhaps another example. A very large proportion of the work that facilitates the network and the conference is done voluntarily, in parallel with employment within Universities and academic institutions (‘firms’ perhaps) and market operations (although perhaps being represented by a gallery still conforms to the ‘firm’ model). The motivations for participating in the network and conference are social-psychological: reputation, consulting contracts (residencies and visiting professorships), customisation services (the creation of new artworks), and human capital gains paid for by employers. “It has particular advantages as an information process for identifying and allocating human creativity available to work on information and cultural resources.” (ibid). There are other aspects of open source, such as the issue of integration, that do not directly parallel with cultural networks, though may be analogous to issues of selection: much art is produced, but only some of it is selected (for public presentation). Other aspects such as the granularity of tasks are also of interest in the management of networked, volunteer-dependent, activities. Benkler argues that a key characteristic of successful open source projects is making each task of a scale proportionate to the perceived social-psychological benefits.